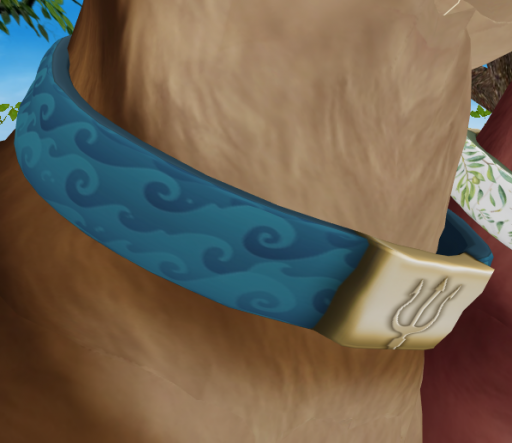 Today it’s my turn to post a connection, and I would like to take a moment to talk about Hues in the horses. 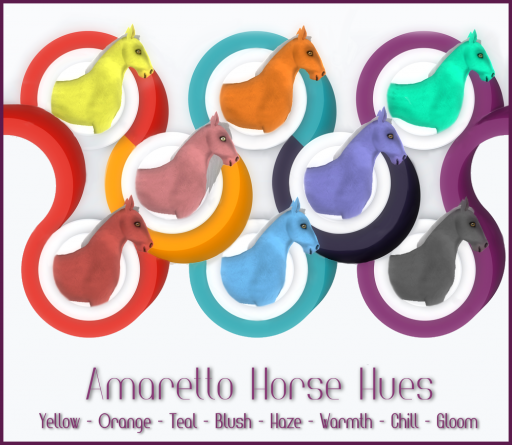 These hue traits can be put on the hair and the coat of any horse and give a unique look to it and it is worth experimenting to see what you can come up with, whether it is mixing the coat chill with a blue coat and making a super blue horse or mixing the coat hue teal with a red coat to make a super deep dark green horse… the possibilities are endless, so try them out! That’s all from me. So check the hues out, mix them up, get creative and enjoy the results of what you come up with. Happy Saturday everyone I hope you all are enjoying this last weekend in September!! 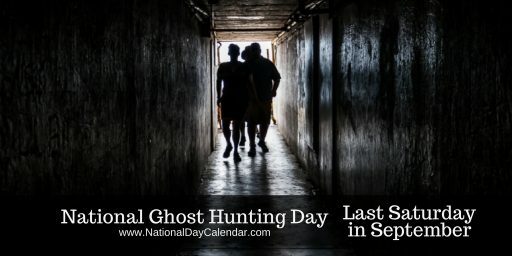 Did you know that on the last Saturday in September as part of the World’s Largest Ghost Hunt, National Ghost Hunting Day kicks off an annual international investigation of the paranormal. to kick off a season full of haunted attractions, fall festivities, encouraging enthusiasts to pursue their interests in the mysteries surrounding the supernatural and to carry on the long-held traditions of ghost hunters. 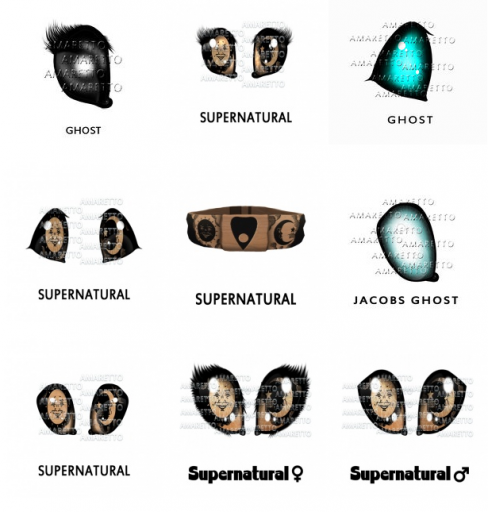 Now you will certainly want to check out these awesome ghostly traits for our horses, k-9s, barnyard birds & ponie pals!! Until next time this is Snookie hoping you have a hauntingly fun day!! Sweet Treats for Autumn Harvest Editions! Hey everyone! Its a great Thursday here at the ranch! I wanted to take a few moments to show off some surprise traits that came from the 2018 Autumn Harvest Edition. 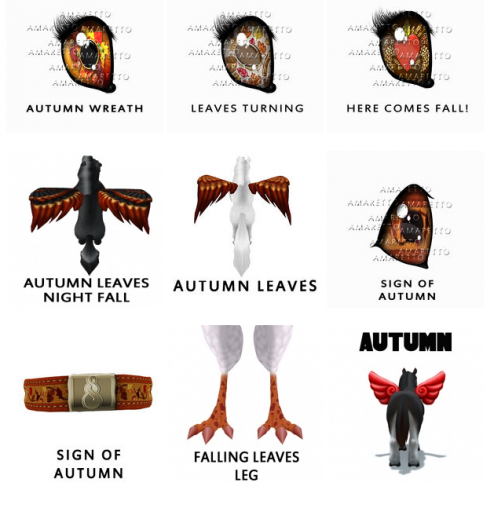 Remember these hidden traits could come from any breeding of the 2018 Autumn Harvest Edition to any animal! 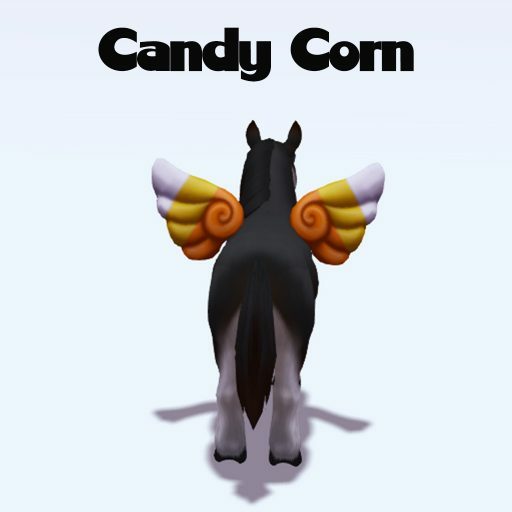 Take a look at these Candy Corn wings! These babies certainly are sweet! Remember these have the ability to pass on! Now for all my horse breeders out there! 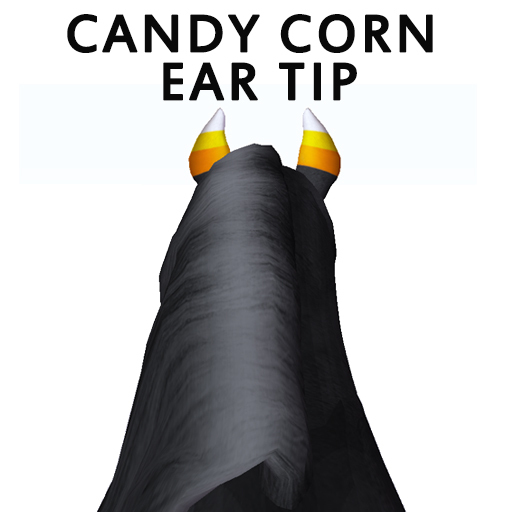 Take a look at this Candy Corn Ear Tip! It will be fun to see what you guys do with these sweet treats! Happy breeding everyone this is Ava over and out! There’s a story from the early days of America, about a near-mythical figure that traveled the American wilds spreading apple seeds everywhere he went. He was known and lauded for his kind, generous ways, and the importance he placed on the apples. To this day he is depicted in stories and song as the man who made apples an American institution and is one of the most beloved characters in its mythology and history. 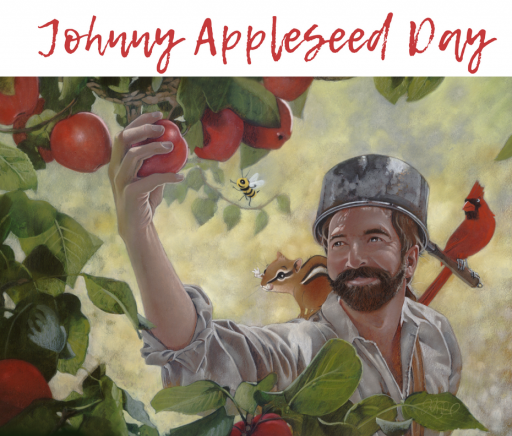 What many people don’t know is that Johnny Appleseed was no mere legend, but was, in fact, an American pioneer known by the name of John Chapman. Born in Leominster, Massachusetts on September 26th, 1774, he was a missionary, a nurseryman and is considered by many to be one of the first American conservationists. Legend states that Johnny Appleseed randomly planted apple trees as he ventured west. That isn’t exactly true, however. Mr. Chapman didn’t plant trees randomly. Instead, as he travelled throughout Pennsylvania, Ontario, Ohio, Indiana, and Illinois, and the lands that would become West Virginia, he planted orchards. He would fence them in and leave them in the care of a neighbor who would then sell shares in the trees, and then come back every year or two to tend them. Celebrating Johnny Appleseed Day is best done by indulging yourself in the delicious fruit that he helped to spread across the United States. You might even consider starting an apple project with these some of these beautiful Amaretto apple traits! 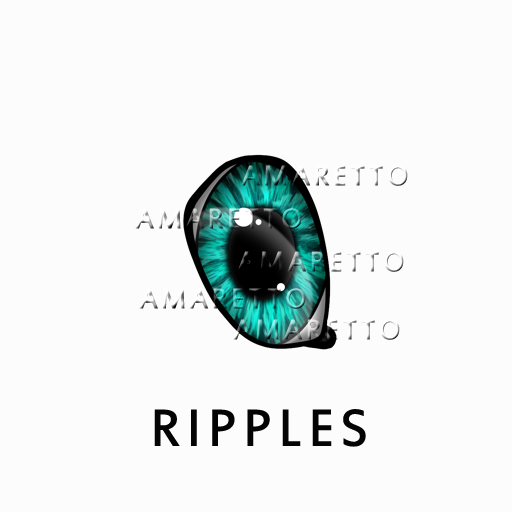 Find even more project ideas by searching the Amaretto wiki pages! Barnyard Bird Update and Duck Q & A! Hello everyone! I hope everyone is having a Terrific Tuesday! Today Amaretto hosted their first Barnyard Bird Update and Duck Q & A! We had a great turn out and a lot of questions! It was good to see all you guys come out and support Amaretto and the Barnyard Birds! Here are some pics of the ducks that were out for everyone to see! I wanted to make sure that everyone who did not get to attend the Barnyard Bird Update and Duck Q & A had a chance to watch the video! Yes a big shout out to Bastian Hax for recording the meeting for everyone to watch! 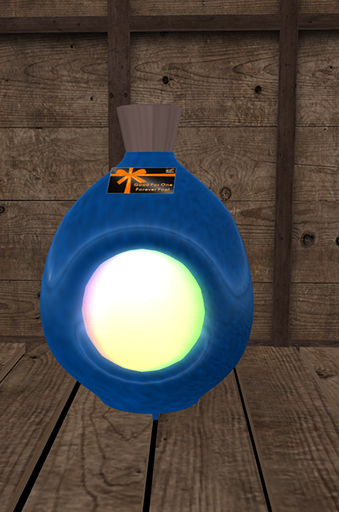 Also we have sent out the second round of beta testing! Please keep your eyes open for any updated news from Amaretto! Happy Breeding Everyone!! Next Showhorse and Elementals Revealed! Hey everyone and Happy Monday! Since you guys have been so patiently waiting…. we thought it would be a good time to let everyone know what the next months show horse is…SOooOO here you go! 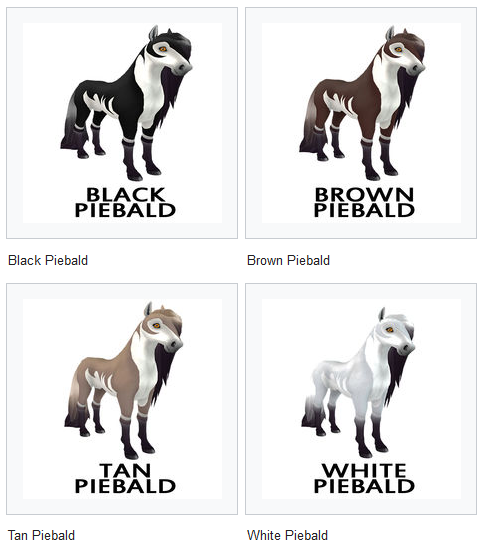 For the month of October if you breed any Piebald to another Piebald you will have a chance at getting an Amaretto Piebald Showhorse! But wait… am I forgetting something?! Ohhh yes, we need to talk about the next monthly breeding for our other animals! The past 2 months have flown by and its time for us to get a new K9, Bird, and Ponie! 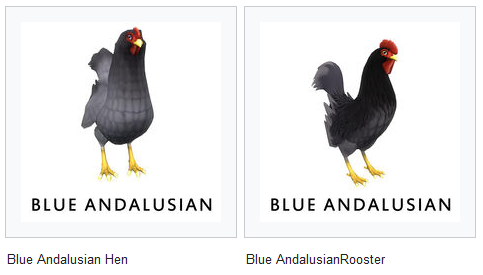 From October 1 to November 30th if you breed any Blue Andalusian with any Ripples Eye you will have the chance to get an Elemental Water Barnyard Bird! 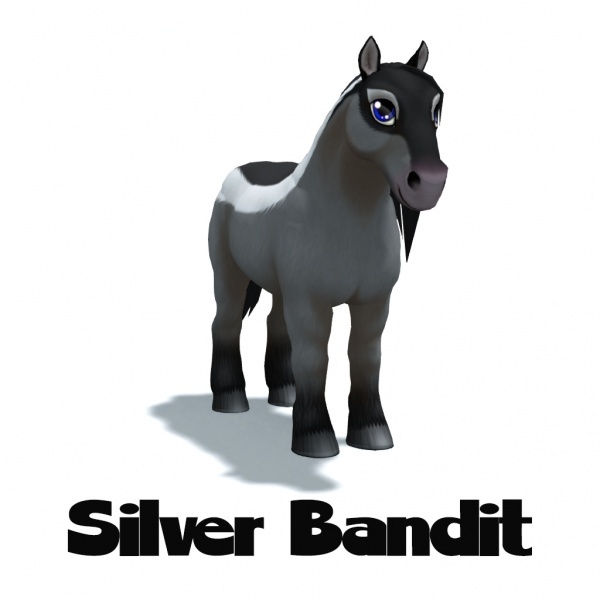 From October 1 to November 30th if you breed any Silver Bandit with any Celestial Face Marking you will have the chance to get an Elemental Water Ponie Pal. 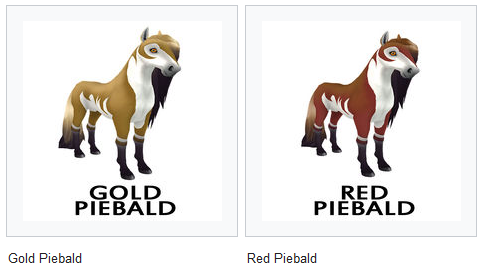 I am excited to see the new Piebald Showhorse and the new Elemental animals!! 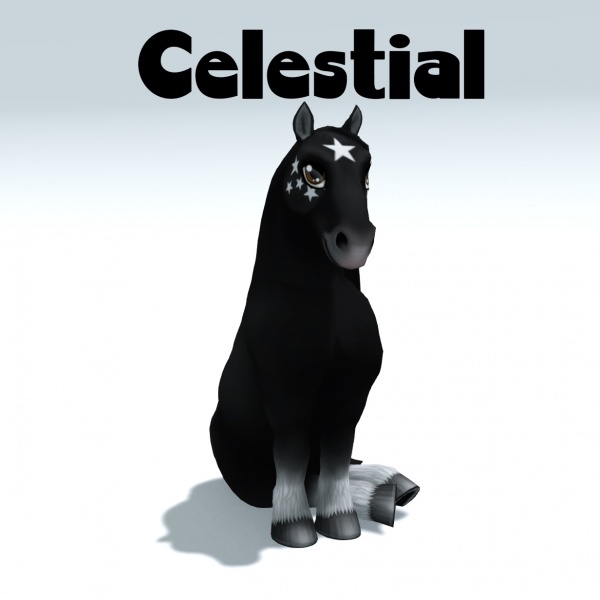 Happy Showhorse and Elemental breeding! 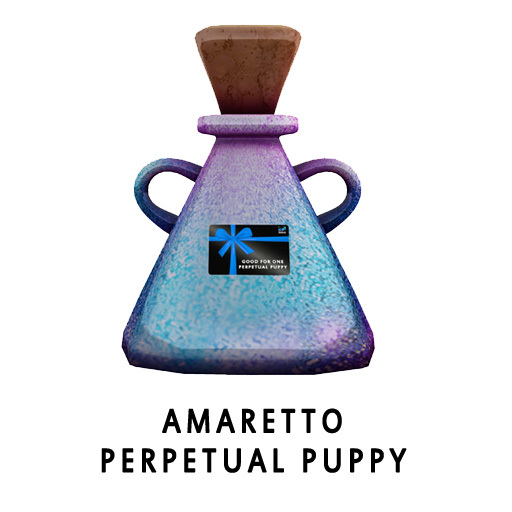 Today I would like to take a look at the Paw Polish traits in the Amaretto K9s! 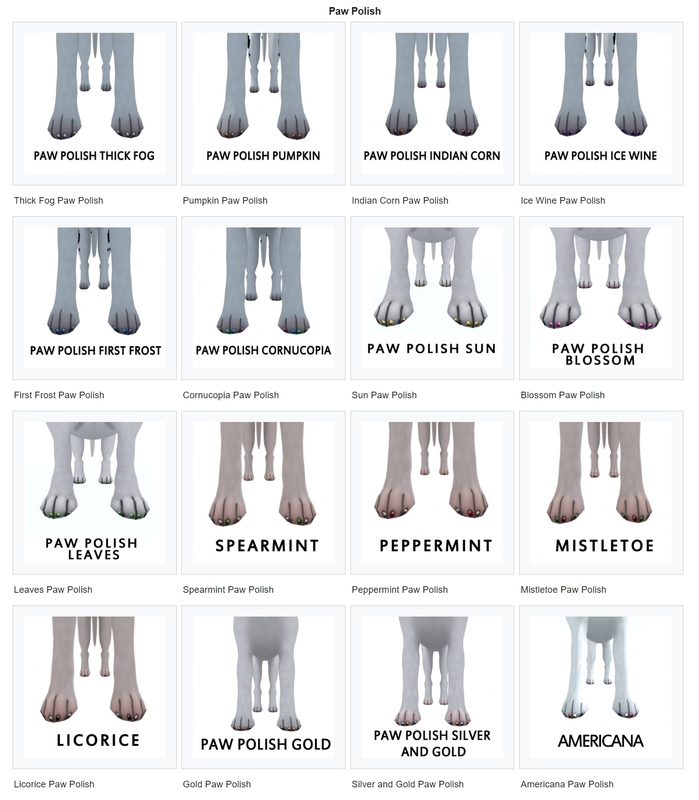 The Paw Polish was introduced with the 2012 Special Edition Fall Fantasy K-9s. 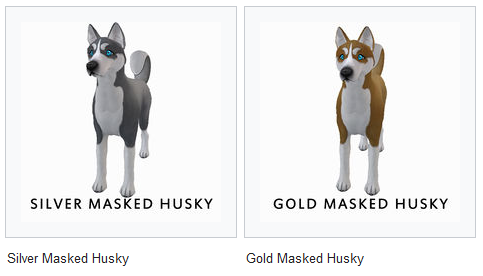 Breeding these K-9s gave you the chance of getting the hidden Thick Fog, Pumpkin, Indian Corn, Ice Wine, First Frost, and Cornucopia Paw Polishes. On April 14,2014 Amaretto released the Special Edition Spring 2014 K-9 – Daisy Doggie, this Daisy Doggie passed hidden surprises of Sun, Blossom, and Leaves paw polish. On December 16,2014 Amaretto released 2014 Holiday. Any breeding of these K-9s gave you a chance at passing hidden surprises of Spearmint, Peppermint, Licorice and Mistletoe Paw Polish. On September 9, 2016 Amaretto release 2016 Fall Special EditionK-9s any breeding of these K-9s gave you a chance at passing hidden surprises of Gold and Silver and Gold Paw Polish. 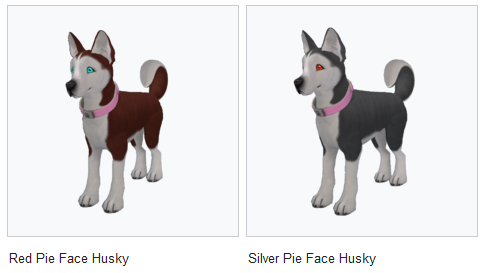 On July 4, 2018 Amaretto celebrated Independence day with traits that randomly dropped for 24 hours the Americana Paw Polish was one of the random traits! Paw Polish DOES have the ability to pass. 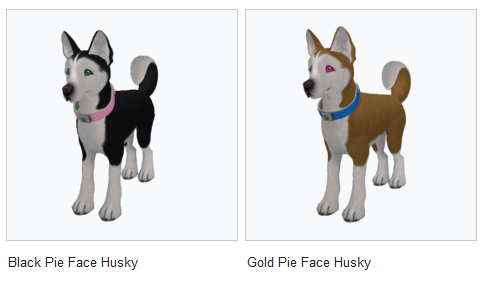 These traits add some funky colors to your pups toes, so check them out and add them to your breeding. That’s all from me today, Happy breeding everyone! Happy Saturday everyone!! Can you believe that in just a few hours summer will be over for some of us!! 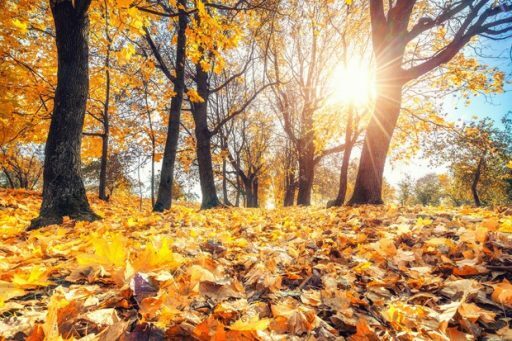 The 2018 autumn equinox, which officially marks the start of fall, arrives on Saturday night, Sept. 22, in the United States and everywhere else in the Northern Hemisphere. The autumn equinox — also known as the autumnal equinox, the fall equinox or the September equinox — occurs when the sun moves directly over the Earth’s equator, bringing almost the same amount of daylight and darkness on that day. 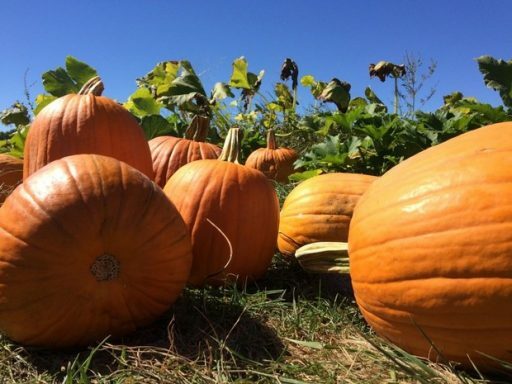 In other words, you can thank the Earth’s tilt and the sun’s position for the season that’s associated with pumpkins, corn mazes, cider doughnuts, Halloween candy and colorful leaves. It also means shorter days and cooler temperatures are on the way. In some cultures around the world, the beginning of autumn is celebrated with centuries-old traditions like feasting on the summer’s harvest and making preparations for the winter. In other cultures, it’s a “time to remember and honor the dead” by visiting, cleaning and decorating their graves, notes TimeAndDate.com. The Druids in England, along with the Maya in Central America, mark the start of autumn “as an indication of the harvest season and even building monuments like (the pyramid of) Kukulcan, where a shadow in the shape of a snake crawls down the side walls of the stone steps during only the two equinox days,” according to NationalGeographic.com. And while we are thinking autumn let’s check out some of these awesome autumnal traits for our horses, k-9s, barnyard birds & ponie pals!! This is just a few of my favorites and there are more on the wiki. Until next time this is Snookie saying Happy Autumn & Happy Breeding!! See you soon!! Everlasting, Beloved, Perpetual, And Forever!!! Hello and Happy Friday!!!! 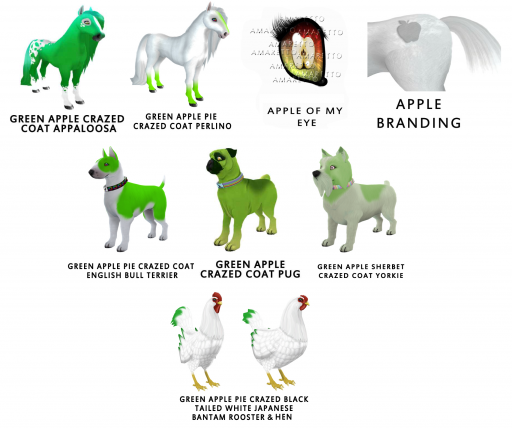 Today I wanted to talk a little about a consumable that is awesome for those horses, K-9, Birds, and Ponies that are no longer breedable! 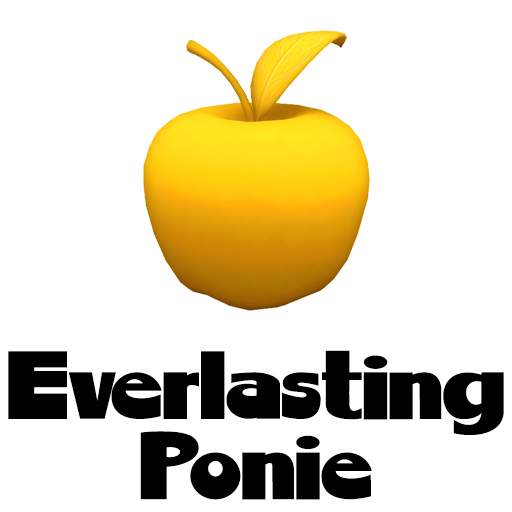 I am talking about the Forever Foal, Perpetual Puppy, Beloved Bird, and Everlasting Ponie! You can purchase these consumables at any Amaretto location! I will take a moment to describe each consumable below! Let’s start with Ponie Pals! *Only works for Senior Birds (Senior Bird= No more cycles remaining) and can be used for both male and female Senior Birds. 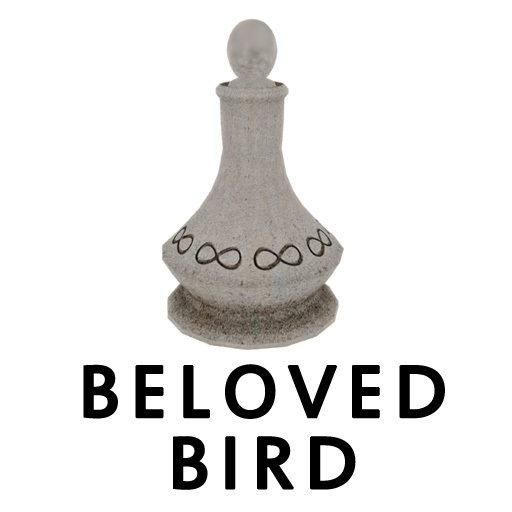 *Makes a Senior Bird so that it will not require food any more. All other normal functions for a Senior Bird will still operate normally. 2. Click the K-9 and go to the consumables option on the menu. 3. Find Per Pup from the options on the menu and click it. 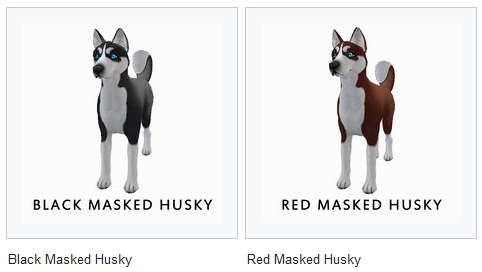 Once the K-9s stats have been updated the Perpetual Puppy jar will disappear. Once the horse’s stats have been updated the Forever Foal consumable will disappear. I hope this helps you save your precious breedables once they can no longer breed for you! Hey everyone! I hope you are all enjoying this FRIYAY Eve! I had so much fun yesterday I had to tell you guys about it! Amaretto has brought back bull riding! We had a great turn out for the event yesterday! 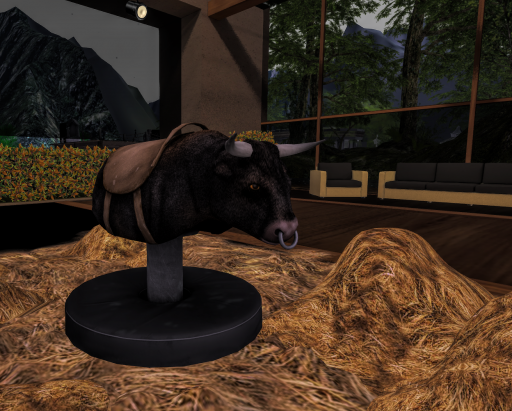 Meet our new Bodacious Bull Bill! He looks scary right? Well a lot of you guys tried to hang on for 8 secs yesterday and yes some even succeeded! 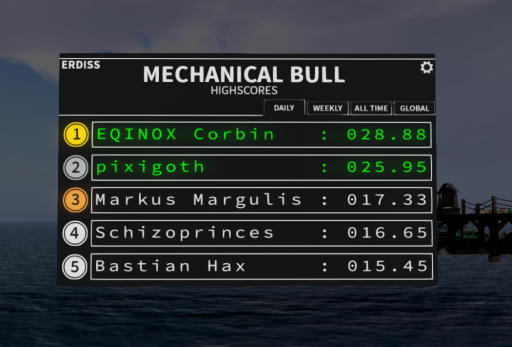 Here is the top 5 scores from the event we had yesterday! A big shout out to all the winners and everyone who came and participated! Even i got in on the fun! Bill has earned his home at club Amaretto so head over anytime and give him a go! I hope you can last longer than 8 secs!